Yes, there is such a thing. Vegan Wine is real. But what is Vegan wine? During the wine making process wine makers ‘fine’ wine. Fining is a procedure for claryfing and purifying the wine juice. In it’s simplist forms fining is all about electrostatic attraction; the fining agent – un-vegan friendly are egg whites, milk protein and isinglass – carries a particular electric charge that reacts with wine solids carrying the opposite charge. Milk whey can also be used in the vineyard under biodynamic practices where it is sprayed over the canopy to combat Powdery Mildew. So, the wine. 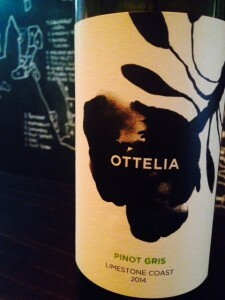 The Ottelia Limestone Coast Pinot Gris 2014; the Limestone Coast is just to the left of the bottle – near Coonawarra. A lovely rich pear aroma comes through on the nose mixed in with some subtle floral notes. The palate see’s more pear – bruised pear I get, and soft subtle spice all the length of the palate. An ACE wine and totally #VeganFriendly.